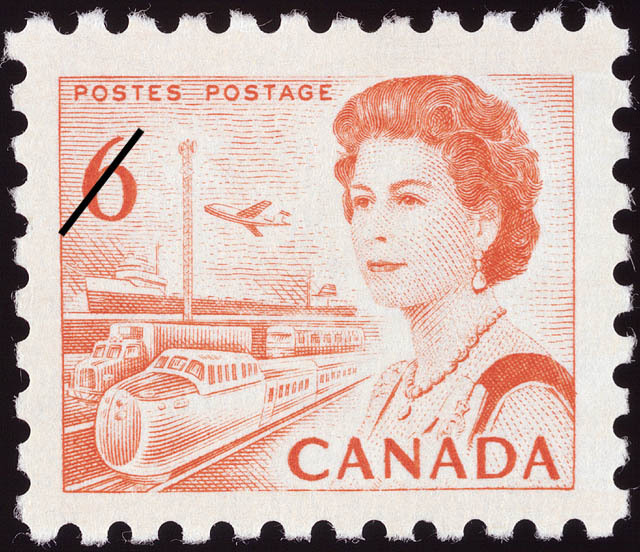 The value of a Queen Elizabeth - 6 cents 1968 stamp depends on several factors such as quality and wear, supply and demand, rarity, finish and more. Values in the section are based on the market, trends, auctions and recognized books, publications and catalogs. This section also includes information on errors and varieties and characteristics. This orange coloured 6 cents engraved stamp emphasizes the importance of transportation and communications in unifying the 5 major economic regions depicted on the 1 cent to 5 cents series. Designed by the Canadian Bank Note Company, Ottawa, this stamp has dimensions of 24 mm x 20 mm; there will be continuous printing by the British American Bank Note Company, Ottawa. Foremost in the left area segment is a modern high-speed locomotive designed for inter-urban use; highway transport is symbolized by a truck and a bus; in the background is a lake vessel, and overhead flies a medium range inter-city jet aircraft. The communications aspect is epitomized by a microwave tower, typical of a continent-spanning system supplementing land-line and cable connections. As in lower denominations in this series, a recent portrait of Queen Elizabeth, engraved from a photograph by Anthony Buckley, is incorporated in the right section of the stamp.